Ahead of Donald Trump’s inauguration as the nation’s 45th president, the public sees a country deeply fractured along partisan lines. Fully 86% describe the country as more politically divided today than in the past, while just 12% say the country is no more divided. For more than a decade, majorities have routinely described the nation as increasingly divided. But the current share expressing this view is the highest it has been at any point since the question was first asked in 2004. The current mood stands in stark contrast to January 2009, before Barack Obama took office. At that time, just 46% said the nation was more politically divided. But a few months into Obama’s first term, the share saying the country was more divided politically had risen to 61%. 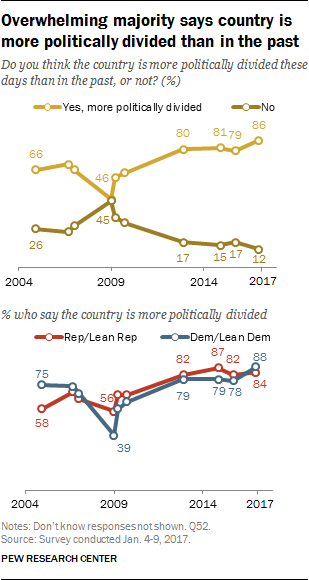 The nature of the country’s political divisions is a rare point of partisan agreement: Comparable majorities of Democrats and Democratic leaners (88%) and Republicans and Republican leaners (84%) say the country is more divided these days than in the past. The latest national survey by Pew Research Center, conducted Jan. 4-9 among 1,502 adults, finds little optimism that the country’s political divisions will subside any time soon: 40% expect the country to be about as politically divided in five years as it is today, while 31% think it will be even more divided; just 24% expect divisions to lessen. In the wake of Trump’s election, there has been an increase in the share of Republicans who think the country will be less divided five years from now. Still, just 36% of Republicans say this; even fewer Democrats (16%) expect the country’s political divisions to narrow in the coming years. In the near term, the public does not think the new Congress and administration will usher in a new era of political comity in Washington: By 61% to 29%, more expect Republicans and Democrats to bicker and oppose each other more than usual in the coming year than to work together more. Over the past few decades, the only times the public expected more cooperation than conflict in the year ahead were in January 2009 and in early 2002, in the wake of the Sept. 11th terrorist attacks. When asked a more general question about the year ahead, public views are mixed: 49% think 2017 will be a better year than 2016, while 42% think it will be worse. Expectations for 2017 are about as negative as for any year over the last decade. Compared with a year ago, optimism among Republicans has surged, while views among Democrats have plummeted. Fully 83% of Republicans and Republican leaners expect 2017 to be better than 2016; a year ago, 44% expected a better year in 2016 than 2015. By contrast, just 24% of Democrats and Democratic leaners expect a better year in 2017 (65% thought 2016 would be better than 2015). 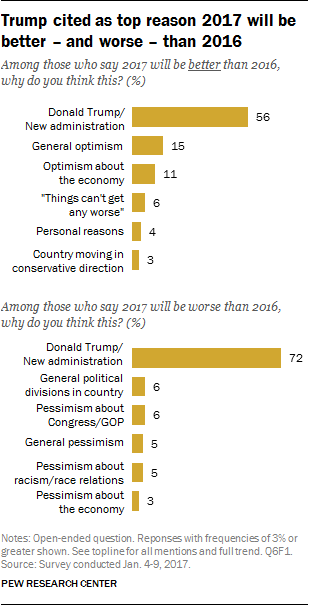 On a follow-up question on why 2017 will be better or worse than 2016, mentions of Donald Trump dominate among both those optimistic and pessimistic about the year ahead. Overall, 56% of those who think 2017 will be better say Trump is the reason they feel this way. No other response comes close (15% offer general mentions of optimism, while 11% express some form of economic optimism). Among those who think 2017 will be worse than 2016, Trump is even more widely cited as the reason for their view. About seven-in-ten (72%) say Trump is the reason why they expect the year ahead to be worse. Far fewer cite other reasons, such as the political divisions in the country (6%) or pessimism about the Republican-controlled Congress (6%). While the 2016 elections have done little to brighten the public’s overall outlook or raise expectations for partisan cooperation, the Republican Party has seen its standing improve in the wake of Trump’s presidential win and the GOP maintaining control of Congress. Today, about as many hold a favorable (47%) as unfavorable (49%) view of the Republican Party. 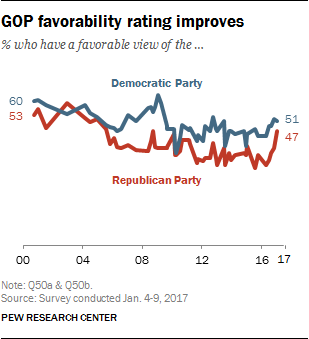 This is the first time views of the GOP have been about as favorable as unfavorable since 2011. The Democratic Party is rated slightly more positively (51% favorable, 45% unfavorable) than the GOP, but the gap in assessments of the two parties is much narrower than it was just a few weeks before the election, in October 2016. Furthermore, the GOP has drawn even with the Democrats as the party seen as “more concerned with the needs of people like me:” 45% say this phrase better describes the Democratic Party, while 44% now say it better describes the Republican Party. In July 2015, far more said the Democratic Party (53%) than the Republican Party (31%) was better described by this phrase. 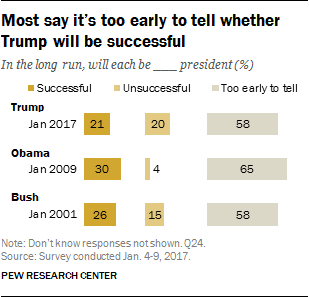 As Trump’s inauguration approaches, 58% of Americans say it is too early to tell whether he will be a successful or unsuccessful president, while the remainder are about evenly divided between those who think he will be successful (21%) and those who say he’ll be unsuccessful (20%). In the days before Barack Obama and George W. Bush took the oath of office, majorities also said it was too early to tell how successful their presidencies would be. But in both cases, those that did offer predictions were more likely to say each would be successful than unsuccessful. For example, in 2009 30% said Obama would be successful while just 4% predicted he would be unsuccessful; 65% said it was too early to tell. Expectations for Trump’s presidency are closely linked with partisanship and ideology. About four-in-ten Republicans and Republican leaners (42%) say Trump will be successful, while just 3% of Democrats and Democratic leaners say this. By contrast, 37% of Democrats and Democratic leaners say he will be unsuccessful, but just 4% of Republicans say the same. 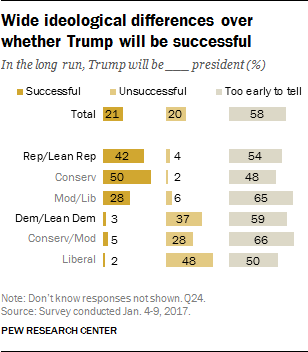 Democrats (59%) and Republicans (54%) are about equally likely to say it is too early to tell how Trump’s presidency will unfold. Among Republicans, conservatives are more likely than moderates and liberals to offer a positive prediction about Trump’s presidency: 50% of conservative Republicans say he will be successful, compared with 28% of moderate and liberal Republicans. Moderate and liberal Republicans are more likely to reserve judgment: 65% say it is too early to tell, while a smaller share of conservatives (48%) say this. And while 48% of liberal Democrats say Trump will be unsuccessful, just 28% of conservative and moderate Democrats say this. Instead, two-thirds of conservative and moderate Democrats (66%) say it is too early to predict whether or not Trump’s presidency will be a success, a smaller share (50%) of liberal Democrats say this. 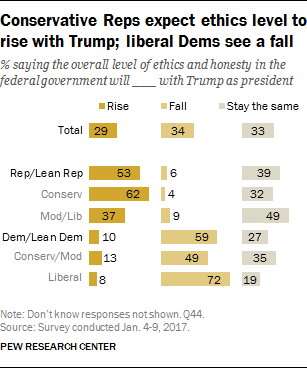 Roughly equal shares of the public expect the “overall level of ethics and honesty in the federal government” to rise (29%), fall (34%) or stay the same (33%) with Trump as president. As with expectations for Trump’s success in office, predictions about federal ethics and honesty during his tenure as president are split along partisan and ideological lines. About half of Republicans and Republican-leaning independents (53%) expect ethics and honesty in government will rise; 39% say they will stay the same while just 6% expect them to fall. By contrast, 59% of Democrats and Democratic leaners say they will fall, 27% expect they will stay the same and just 10% say they will rise. There are ideological divides within the two parties – 72% of liberal Democrats, compared with 49% of conservative and moderate Democrats, expect the level of ethics and honesty to fall with Trump as president. And while 35% of conservative and moderate Democrats expect little change in the overall level of ethics in the federal government, just 19% of liberals say this (only 8% of liberals and 13% of conservative and moderate Democrats expect ethical levels to rise). Among Republicans and Republicans leaners, 62% of conservatives predict ethics in government will rise, compared with a smaller share (37%) of moderates and liberals. More people say Trump will have some impact – for better or worse – than said this of Bill Clinton in early 1993. Half (50%) said ethics and honesty in government would stay the same with Clinton as president then; just a third (33%) say this now for Trump. Only 13% of the public expected federal ethics to fall under Clinton and 35% said they would rise. As Trump prepares to take office, 65% say it is more important for the president-elect to focus on domestic policy; far fewer (19%) say it’s more important for him to focus on foreign policy. Majorities have said domestic policy should be the president’s priority for much of the last decade. The last time the public gave as much emphasis to foreign as domestic policy was in 2007, during George W. Bush’s second term. At that time, 40% said it was more important to focus on foreign policy, compared with 39% who said it was more important to focus on domestic policy. The public’s emphasis on domestic policy is evident in its views of the country’s biggest problems. When asked in an open-ended question what the most important problem facing the nation is today, about one-in-ten (11%) volunteer health care-related issues such as affordability and accessibility. When last asked in December 2015, just 3% said healthcare was the most important problem facing the country. The share citing healthcare as the most important problem facing the nation today is as high as it has been since 2009. Similar shares volunteer the economy generally (10%) or unemployment (10%) as the most important problem facing the country today. About one-in-ten also see race relations (10%) or Donald Trump and his incoming administration (9%) as the country’s top problem. Overall, the share of the public citing any one foreign policy or international issue as the nation’s most important problem stands at 15%, down 17 percentage points since December 2015 when nearly a third (32%) cited issues such as ISIS and terrorism. Today, a combined 29% cite any one economic issue as the most important problem facing the country. As has been the case over the last several years, Republicans (10%) are more likely than Democrats (2%) to volunteer national security as the most important problem facing the nation today. 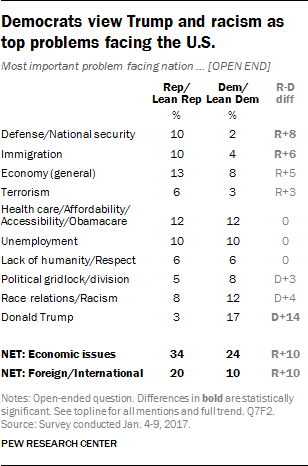 Republicans also are more likely than Democrats to say immigration is the most important problem (10% vs. 4%). By contrast, Democrats (17%) are much more likely than Republicans (3%) to say Donald Trump is the most important problem facing the country today. In February 2009, weeks after Obama took office, fewer than 1% of Republicans said he was the most important problem facing the country (no Democrats said this). Equal shares of Republicans and Democrats (12% each) name a health care-related issue as the county’s top problem. Following the 2016 election, views of the Republican Party have improved significantly, while views of the Democratic Party are little changed. For the first time since 2011, about as many have a positive as negative impression of the Republican Party: 47% now hold a favorable view of the GOP, compared with 49% who have an unfavorable view. The share who views the Republican Party favorably is up 7 percentage points since October and is 14 points higher than it was in April of 2016. Ratings of the Democratic Party remain somewhat more positive than those of the Republican Party, though the gap in assessments of the two parties has narrowed. 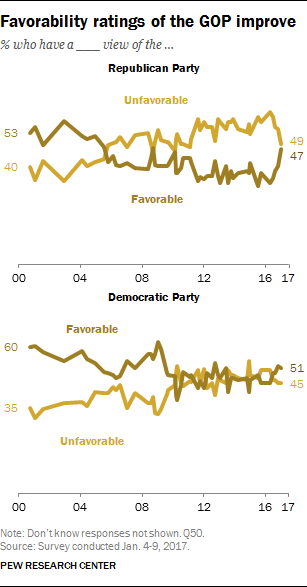 Overall, slightly more hold a favorable (51%) than unfavorable (45%) view of the Democratic Party. These ratings are about the same as they were last October. The improvement in the Republican Party’s favorability rating is most pronounced among independents who lean toward the GOP. In the wake of Trump’s victory, about seven-in-ten Republican leaners (72%) have a favorable opinion of the GOP, which is up 15 points since October and 29 points since April. Republicans are about as favorable toward their party today (83%) as they were in October (82%), though ratings have improved 15 points since the spring. Democratic views of the GOP have also ticked more positive than in recent months, though just 20% of Democrats and 27% of Democratic leaners view the Republican Party favorably. 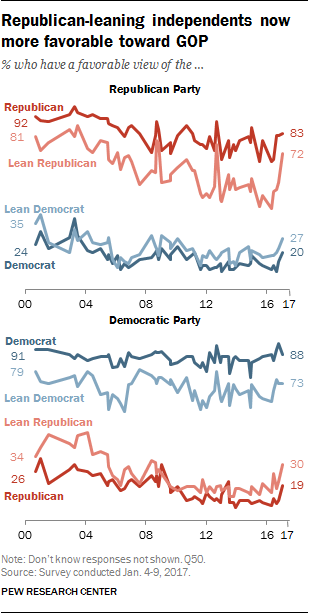 While overall ratings of the Democratic Party are unchanged since the fall, there have been shifts in views among subgroups over this period. Favorable views of the Democratic Party are down slightly among Democrats (88% today, from 94% in October), but they are unchanged among Democratic leaners. Both Republicans (up 8 points) and Republican leaners (up 9 points) are somewhat more likely to rate the Democratic Party favorably today than they were in October. In addition to improved favorability ratings, the Republican Party has now drawn even with the Democratic Party when it comes be being seen as the party “more concerned with the needs of people like me.” Overall, 45% say this phrase better describes the Democratic Party, while about as many (44%) now say it better describes the Republican Party. In July 2015 – the last time the question was asked – far more said the Democratic Party (53%) than Republican Party (31%) was better described as “more concerned with the needs of people like me.” This is the first time the GOP has run even with the Democratic Party on this measure in surveys dating to 1988. 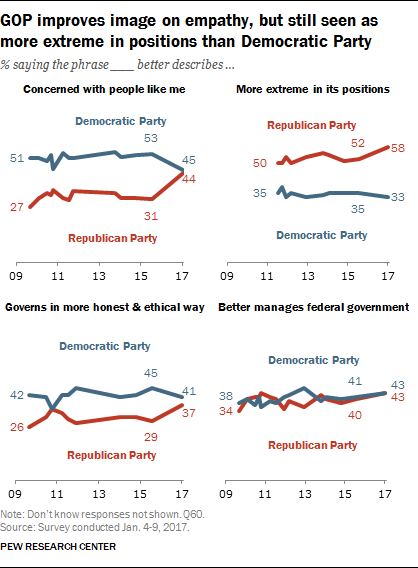 The public is also about evenly split on which party can better manage the federal government and which governs in the more honest and ethical way. Overall, 41% say the Democratic Party is better described as governing in a more honest and ethical way, while roughly as many (37%) say this about the Republican Party. This is another measure on which the GOP has improved its standing. In July 2015, a greater share said the Democratic Party (45%) than Republican Party (29%) was more honest and ethical in their governing. The public is equally likely to say the Republican (43%) as Democratic Party (43%) can better manage the federal government. Views on this question are little changed in recent years. The GOP continues to fare worse than the Democratic Party when it comes to which is more extreme in its positions. 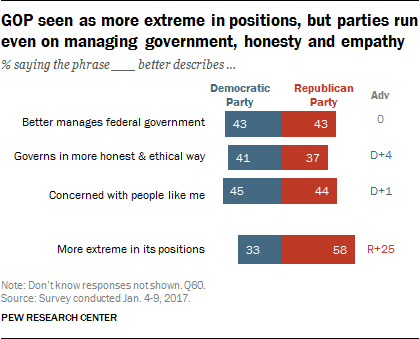 Nearly six-in-ten (58%) say the Republican Party is more extreme in its positions; just a third the Democratic Party is more extreme. The public has consistently seen the Republican Party as more extreme in its views. The share who say this today is up six points from 2015 and is as high as it has been since the question was first asked in 2011. About six-in-ten Americans (61%) expect that Republicans and Democrats in Washington will bicker and oppose one another more than usual, while just 29% say they expect the parties to work together more. Majorities have expected the parties to bicker and oppose rather than work together in recent years, though public predictions for partisan cooperation were substantially higher on the eve of Barack Obama’s inauguration eight years ago. In January 2009, 50% expected the two parties to work together more, while fewer (39%) expected greater hostility. Though both Democrats and Republicans are more likely to say they expect greater opposition and disagreement than usual than to say they predict cooperation, there is a wide partisan gap in these views. 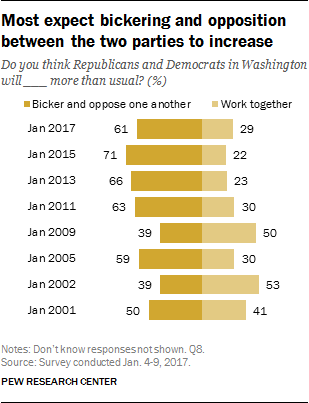 Half of Republicans and Republican leaners (50%) say the parties will bicker and oppose one another more than in the past, while 40% say they will work together more. Among Democrats, fully 72% expect more bickering and opposition and just 21% expect greater cooperation. In 2009, both the incoming president’s party and the opposing party were more likely to predict growing cooperation than they are today, though the size of the partisan gap in views was nearly identical to today. A few days before Obama first took office, a 59% majority of Democrats expected greater cooperation, while just 31% expected more tension. At that time, 51% of Republicans expected more bickering while 36% anticipated greater cooperation. The public continues to express favorable views of many federal agencies and departments. All 10 agencies and departments in the survey are viewed more favorably than unfavorably. But the U.S. Postal Service receives the highest marks: 86% view it favorably, while just 11% view it unfavorably. The FBI, CIA, and Department of Justice remain popular with the public. About seven-in-ten (69%) say they have a favorable view of the FBI and roughly six-in-ten view the CIA (62%) and the Justice Department (61%) favorably. Views of the FBI are little changed over the last year, while views of the CIA and Justice Department have improved modestly during this time period. And by more than two-to-one, more Americans say they have a favorable (63%) than unfavorable (27%) impression of the Environmental Protection Agency, the EPA. Ratings of the Department of Health and Human Services (HHS) are similar (64% favorable, 24% unfavorable). Ratings of the Internal Revenue Service (IRS) are now more positive than negative – a 58% majority now see the IRS favorably, while just 33% view it unfavorably. As recently as the fall of 2015, more Americans viewed it negatively than positively (52% unfavorable, 42% favorable). The Department of Veterans Affairs (VA) receives the lowest favorability rating for the departments and agencies in the survey –49% view it favorably while 34% have an unfavorable opinion. 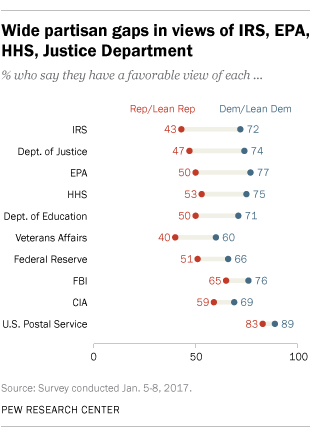 As in the past, Democrats and Democratic leaners have more favorable views of the federal agencies and departments in the survey than Republicans and Republican leaners. Roughly three-quarters or more Democrats have favorable impressions of the Department of Justice, the EPA and HHS. By contrast, only about half of Republicans view these agencies positively. And while 72% of Democrats have a favorable view of the IRS, just 43% of Republicans say this. Similarly, though the VA is viewed positively by 60% of Democrats, only 40% of Republicans say the same. Currently, 69% of Democrats and Democratic- leaning independents rate the CIA positively, compared with a narrower majority (59%) of Republicans and Republican-leaning independents. In the fall of 2015, there was no significant difference in the CIA’s ratings by party (62% of Republicans and 59% of Democrats rated the agency favorably). With just a few days remaining in Barack Obama’s presidency, 55% say they approve of his handling of the job; 40% disapprove. His current rating is little different than in recent months, though he leaves office with approval ratings that are as high as they have been since shortly after his re-election in 2012. As has been the case throughout much of his presidency, Obama’s ratings are higher among younger Americans than older Americans (63% of those ages 18-49 approve of Obama’s job performance, compared with 47% of those 50 and older). There also continue to be wide differences in Obama’s approval ratings by education (65% of those with at least a four-year college degree approve of his performance, compared with 51% of those with less education) and race (46% of whites, vs. 86% of blacks and 68% of Hispanics approve of Obama’s handling of the job).